Russian shipbuilders on Monday launched the last of the six Kilo-class submarines ordered by the Vietnamese Navy. 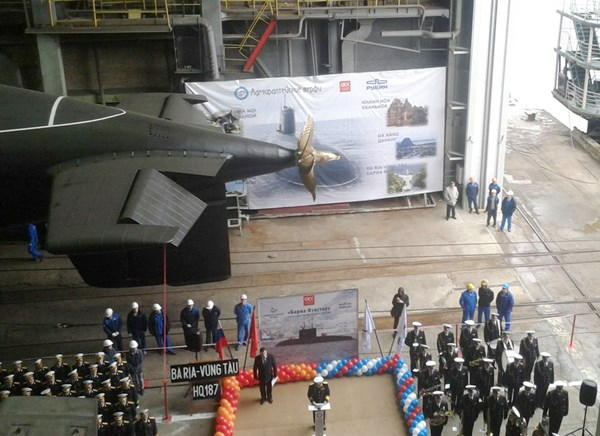 Admiral Viktor Chirkov, Commander-in-Chief of the Russian Navy, and Rear Admiral Pham Hoai Nam, Commander of the People's Navy of Vietnam, were present at the launching ceremony for the submarine, codenamed HQ-187 Ba Ria Vung Tau, at the Admiralty Shipyard in St. Petersburg. It is part of a deal reached between Vietnam and Russia for six Project 636 Kilo-class diesel-electric submarines for $2 billion back in 2009.